Jim Corbett National Park, the oldest tiger reserve forest in India, is a highly popular destination for wildlife enthusiasts. Thousands of people from all over the world used to visit here to have a tryst with one of the most ruthless predators of the wild forest, the Bengal Tiger. Being a reserved natural habitat for plenty of wild animals, all the tourism activity in the forest is managed by the forest department of the Govt. of Uttarakhand state. In order to make an entry inside the reserve park, you need to obtain the entry permit from the concern authority. Without the entry permit, you will not be allowed inside the park in any condition. 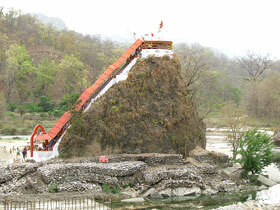 There are two types of tourism services provided by the forest department at the Corbett. One is Day Safari and other is an Accommodation at FRH. The day safari permit can be obtained at the entry gate of the respective zone while the permit for night halt at different forest rest houses located inside the forest is issued at the reception office of the Corbett reserve park in the Ramnagar city. Also, the day safari or accommodation at FRH can also be booked online in advance. Once you obtain the permit, neither it is transferable nor refundable. All the zones have specific beauty and features of its landscape which should be explored to have the complete experience of this national park. Also, different zones have its own attraction due to the wide range of alluring flora and fauna found specifically in that zone. Tourism activities in varied zones are administered by the forest authority of that zone. The permit to enter in any zone needs to be obtained from the office of the respective zone authority at the entry gate of that zone. Except the Dhikala zone, all zones offer the permit for the day visit inside the park for the allotted time period. Permit is given only for the jeep safari and a maximum of 6 adults and 2 children (Up to 11 years of age) are allowed in one jeep. Tourists can enter inside the reserve forest only through the jeep authorized by the forest administration, not by walking or in any private vehicle. 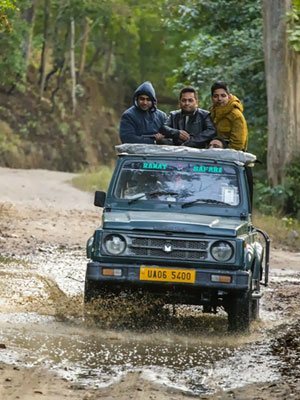 In order to maintain the ecological balance and to keep the tranquil environment for resting animals, there are limited numbers of jeep safari allowed to enter in the park at a time. The day safari is allowed in two shifts, one in the morning and one in the afternoon as per the prescribed time. Timings of entry and exit may vary in the different zones and with the change of season. 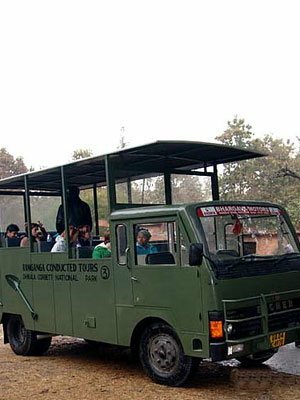 Due to the heavy rush for the wildlife tour in Corbett, it is highly advised that one should book permit in advance for the day tour. Booking is done as per the first-come-first-served basis at the reception office of Corbett tiger reserve as well as online booking facility is also available. A registered guide is mandatory with each jeep safari and can be hired at the entry gate. In summary, in order to enter inside the park, at first you have to obtain the entry permit, then hire the authorized jeep for the safari and then hire a registered guide. All these three things are mandatory to get inside the reserve forest. The jeep safari is an excellent option to explore the wildlife in its natural habitat inside the Corbett tiger reserve in a day. Every eco-tourism zone of the park allows the jeep safari except the Dhikala zone. 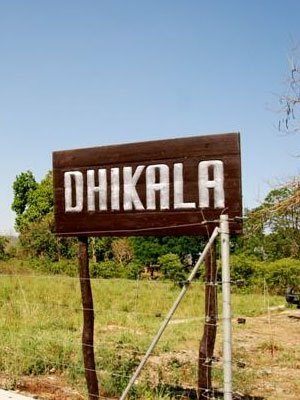 In the Dhikala zone, jeep safari is available only for the tourists who have prior booking for the night stay in the Dhikala forest rest house. However, the Canter safari is made available in this zone for the day visit tourists and is the only option to explore the Dhikala zone if you don't have the booking for the forest house. Canter Safari is actually a bus safari with 16 seats in it and operated by the forest authority only in the Dhikala zone. Always book your seat in canter safari in advance to make sure you will get the seat on the bus when you visit the Corbett Tiger reserve. 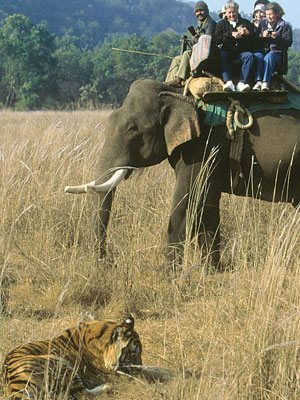 Exploring the wilderness of the Corbett forest riding on the elephant's back could be a thrilling experience, especially to the children. Elephant ride is available only in Dhikala and Bijrani zones. However, elephant ride in Dhikala zone is available only for the tourists staying at the forest rest house, but in the Bijrani zone, day visitors can enjoy the elephant ride after paying for it at the camp. There are very limited numbers of elephant used for the safari and it is available on the first-come-first-served basis. Four persons are allowed at a time to sit on an elephant and children up to 5 years of age are complimentary with the adults. There is no elephant safari organized on Monday as it is the rest day for the elephants. Jim Corbett National Park is among few national parks in India that allows night halts in the heart of the forest. For the night halts in forest, park administration provides three tourist complexes located at Dhikala, Gairal and Bijrani with the choices of accommodation types. Dhikala forest lodge has the maximum bed capacity including the two dormitories. Dhikala is the premium zone and a most sought after destination by the wildlife lovers. Basic dining & lodging facility is available for tourists at other Forest Rest Houses at Sultan, Malani, Gairal, Khinanauli, Sarpduli, Kanda and Jhirna. Tourists can make the booking minimum for one night and a maximum of three nights only. Some of the other available options where visitors can stay at the Forest Rest Houses are Lohachaur, Rathuadhab, Halduparao, Mundiapani, Morghatti, Sendhikhal and Dhela. Prior reservation for accommodation can be made online by remitting the necessary tariffs in advance. Once accommodation is reserved, permits can be collected from the Ramnagar Reception Office before entering the Park. It is advisable to make bookings well in advance as it is almost impossible to obtain a permit for accommodation in the FRH on the spot without prior booking. Indian tourists can make an accommodation booking up to 45 days in advance, while foreign nationals can make bookings up to 90 days in advance. However, who didn't get permit to stay in forest guest houses can stay in the exotic resorts, star hotels and lodges run privately just outside of the Corbett tiger reserve, and make day-visits to the park as long as they want. Advance permit for the day visit or for the night halts along with the jeep safari and a registered guide can be booked through us. You have to simply fill the query form and we will get back to you as earliest.